← Veggie of the month: Peas! 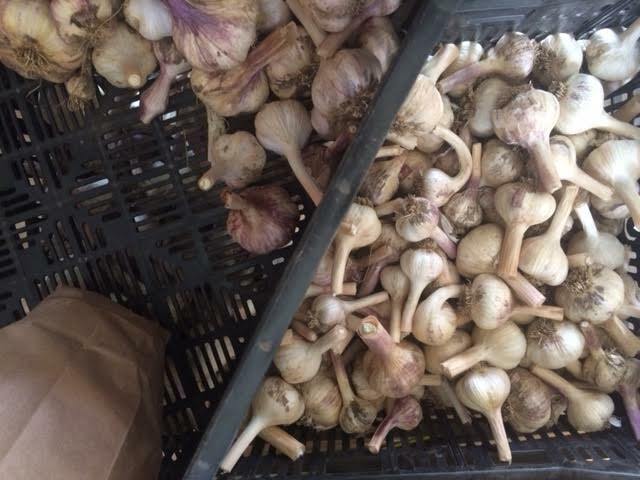 Happy garlic season! Many weeks have passed since scapes and green garlic, and we are so excited for garlic to be back in our lives! 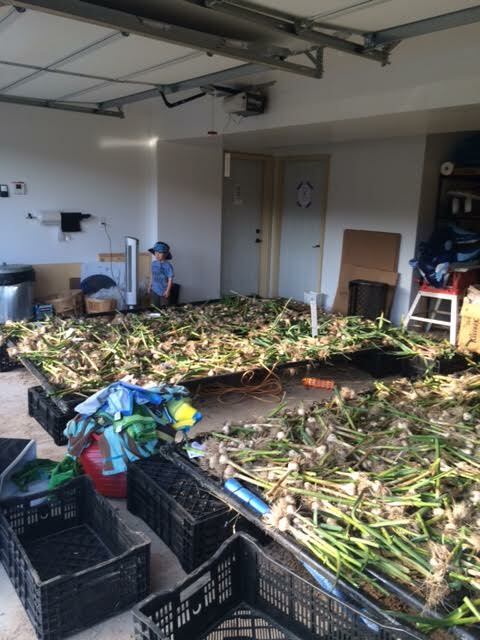 Last year, we unfortunately lost most of our garlic crop in the curing process due to the unfavorable (wet and cool) summer we had. This year we decided to drastically revamp our harvesting and curing process, and we are glad to report that it has payed off! We harvested on a dry sunny day, and used a broad fork to loosen the bulbs from the soil before pulling them out to prevent bruising. We then cured them in our garage, which we heated to 90 degrees. It sure got warm and garlicky smelling in there! Here are all 2000+ heads drying in the garage. Music– A medium-hot garlic that can be stored for up to a year! German Red– Strong full-bodied flavor with 8-10 cloves/bulb. Stores well. Chesnok Red– With gorgeous purple stripes and a mild flavor, this garlic is great for cooking. Georgian Crystal-This garlic is mild when eaten raw, and smooth and creamy roasted. It is an excellent keeper with 4-6 cloves/bulb. Georgian Fire– This mildly hot hardneck garlic has a strong raw taste with a hotness that is pleasant. Great for salsa and salads. 4-6 cloves per bulb. Spanish Roja-This gourmet hardneck has a classic rich garlic flavor. The cloves have a beautiful brownish red color. Keeps 4-6 months. Easy to peel. 8-12 cloves/bulb. This heirloom artichoke type soft-neck garlic was brought from Italy around 1850. It has a robust, hot/spicy flavor. Great for roasting. Easy to peel. Excellent keeper.